Samsung has decided that there's been far too many phone-related stories today, and has released three new camera ranges to break the monotony. The most impressive announcement has to be the IT100. 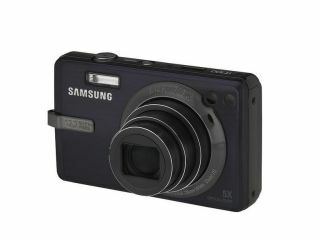 This 12MP compact snapper comes complete with a 3-inch TFT LCD screen, 5x optical zoom capabilities and a 28mm wide-angle lens. If that wasn't all, the camera combats low light well, with an ISO range of up to 3200, and deals with hand judder nicely thanks to its Dual Image Stabilisation feature. Those who want to use the camera to shoot short movies will be pleased to hear that your directorial efforts will be in HD. There's also the ability to pause and re-record HD videos in the same clip – a feature unique to Samsung. Handily, the camera also has Smart Album, which will archive your shots in a variety of ways, from theme to colour. As always, a load of 'detection' features are present and correct: Face, Blink and Smile being the favourites. Samsung also announced non-HD updates to its P- and E-Series camera ranges. The 10MP PL50 and 12MP PL65 are aimed at the enthusiast market and boast Smart Auto – 11 pre-set scenes to cater for whatever weather you are shooting in. As well as having all the 'detection' options you can handle, the cameras also come equipped with a new feature – Frame guide. Instead of taking an image straight away, you can take a preview version of the shot. Switch on the feature and you can show a template image to those who are taking your image, so they have an idea of how you want the photograph to be taken. The final camera announced is the ES15. Aimed squarely at the beginner end of the market, the camera uses a 10MP sensor, has 3x optical zoom and some interesting gimmicks – like Beauty Shot, Digital Image Stabilisation and the obligatory Face Detection. Available in Candy Pink, Silver, White and Dark Grey, the ES15 costs just £79 and is released in April. The HD Ready IT100 is also out in April, comes in silver, black or red, and will set you back £229. The PL50 is out in March for £119. It will be available in candy pink, black and silver. The higher-specced PL65 is also out in March, costs £179 and comes in black, pink, silver and dark grey.